DT correspondent Kelly Diamond (C'13) has been busy studying for finals, but she sent in 2 videos that gladly distracted her from hitting the books. After the jump, check out what sorts of fun you can find in Houston Hall around this time of year. 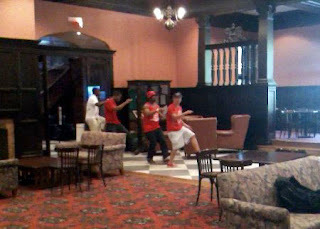 "While falling asleep on my laptop at 6pm and praying for caffeine, these guys started a step train all through the second floor of Houston Hall. It is unfortunate, however, that a few friends and I were the only people to witness the action. We enjoyed the performance though, as well as the color coordination, until they stopped and we had to go back to studying. Lame." "Little known fact: Penn-sponsored study breaks are da bomb, especially when they include puppies. For the life of me I could not tell you exactly who made this event happen, but wandering down to Wynn Commons and spotting dozens of vest-wearing canines made my day infinitely better. Oh, and then I went to the library, where the only furry creature was the dust bunny floating across the floor."